A water beetle larva, a predator with sharp fangs, the brown gut shows it isn't a herbivore. Many insects are semi or fully aquatic. So in every pond you will find larvae of insects. They are not microscopic but they have many interesting features that can be examined with the microscope. If you like to study the internal anatomy of organisms you don't have to be a surgeon and dissect living things. Most insect larvae are so transparent that you can look right through them. Almost all basic anatomical features in living things can be studied without any effort and while the organism is still alive. You don't need high power microscopes for this, a 10X objective is enough to see many interesting anatomical features. Insects are highly advanced organisms. They have a well developed brain and nervous system, a heart and blood circulation system. If you look closely you can see the blood flowing through the body. The muscles operating the body, limbs and jaws can be seen as light bands with very faint stripes. A method to get a clearer look at the muscles is to use crossed polarized filters in the microscope. One filter has to be placed in the filter holder near the condenser, the other one is placed above the lens. If the direction of polarisation of the two filters is opposite to each other (crossed) the background becomes dark while the muscles light up. Not all insect larvae are flat enough for anatomical research. The smaller more transparent mosquito and midge larvae will do fine. A remarkable example is the phantom midge, Chaoborus. 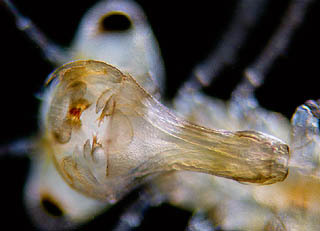 It is completely transparent apart from two pairs of gas sacs which enable the larva to keep a perfect balance. It can move extremely rapidly by flexing its body. Tail feathers enhance the propulsion. The antennae developed in a claw that is perfect for capturing prey. 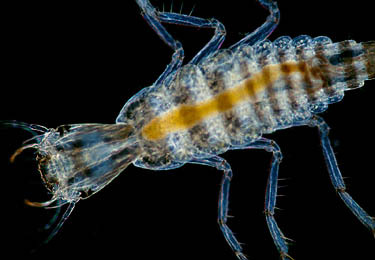 Mayfly larva are very interesting for a study of the insect respiratory system. Insects don't breath with lungs. Oxygen is transported through the body tiny tubes called trachea. The trachea have ring-like supports so they appear striped. 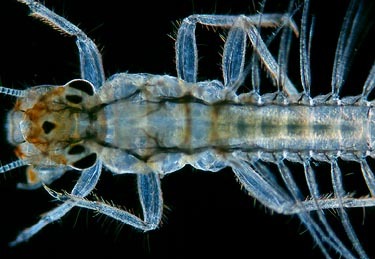 Mayfly larvae are fully aquatic. They have special gill-like structures connected to the trachea. 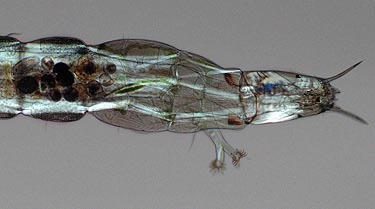 In this species you can see them along the body as the long strands on the right. Near the base of the gills we can see the trachea as dark tubes. They branch into finer tubes so all the parts of the body can be reached. Larvae of dragonflies, and water beetles are spectacular subjects for study with a low power (stereo) microscope or with a hand lens. Their behavior can be observed in a small tank. They are ferocious carnivores equipped with huge jaws to capture prey. Dragonfly larvae have special extendable jaws for surprise attacks! Apart from insects there are some other aquatic arthropods that are worth a closer examination under the microscope. Visit the gallery of watermites, small aquatic relatives of spiders.